An updated settings screen. A couple additions, and your settings are now remembered between sessions. 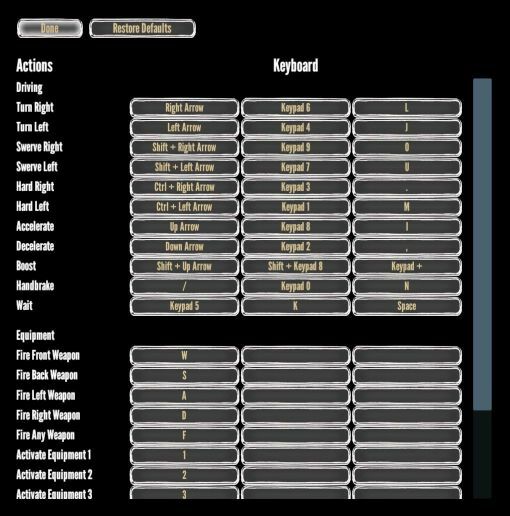 A Key Configuration screen! Laptop user? Old-school roguelike player? Set keys to your heart's content! An updated introduction screen. You won't have to re-enter your character name or car selection each time, these also persist across sessions. So many keys! Wanted a rundown of which vehicle fits your playstyle? More information is shown at selection time! A number of bug fixes around targeting and shooting. That's it, more of a fundamentals update. Don't worry, there are more fun-fun shooty-shooty updates in the cards for next time!